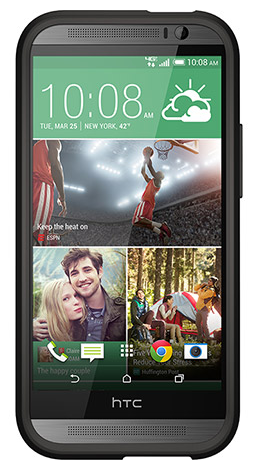 A couple of months ago, I got the HTC One M8 phone. I have been really liking it and decided that in order to save it from my clumsy hands, I better get a case for it ASAP. I was sent a couple of phone cases from OtterBox to try out for my phone and really like them. The first case that I tried out is the Symmetry Series for the HTC One M8. 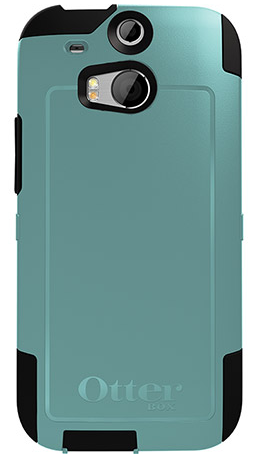 It is one of the slimmest cases from OtterBox which is what I liked most about it. It comes in several very fun colors and color combos. For my review, I stuck to the black case which is simple and functional. Due to my butterfingers, I have already dropped my phone twice (once was pretty hard) with this case on and it held up really well with only one small scratch. This is much better than what would have happened with another case. I really like this case and plan to continue to use this for a long time. It retails for $39.95. The other case that I reviewed was the Commuter Series case. This case has 2 different pieces and you can choose the custom colors to go on the case which is awesome. I chose teal and black which looks very nice. It also comes with a self-adhesive screen protector to keep the screen safe. This case is a bit bulkier than the other Symmetry Series so I plan to use this case less often. It is built for functionality and retails for $39.90. Prior to this experience, I have always bought super cheap phone cases off of Amazon (for about $8 or less). They scratch easily, stretch out, etc. I can tell that these cases from OtterBox are a much higher quality and will last a long time. Also, my husband reviewed cases from OtterBox back in December which he still loves and is holding up well. I truly like my Otterbox case for my HTC. The main thing I dislike is the plastic shield for the screen. It influences the way the touch screen lives up to expectations. I needed to remove it.